Welcome to the Latvia Hotel. . . .
That’s where we find ourselves as A Tourist Visa opens, in the company of young Canadian traveler Curtis Jansons as he faces the implacable might of the Soviet regime at the customer counter of the Intourist Bureau. For this is Riga in 1982: Leonid Brezhnev is chairman of the presidium, Latvia is a Soviet republic, and warmth is reserved for expression behind closed doors. On a journey to meet his long-lost grandfather, Curtis, a naive, optimistic half Latvian, finds himself in culture shock—until he meets Intourist officer and fellow half-breed Galina, who suddenly changes the stern mask of bureaucracy into a pretty human face. He makes a date with her and gains a privileged glimpse into her private world, and, along with it, into his own nascent soul. I started writing this story at age 23, on a trip to meet my own grandfather in Riga, while at the same time trying to assimilate the overwhelming impressions of a long solo trip to Europe, Israel, and parts of Africa. I finished the story three years later, when I had settled down to a normal(ish) life back in Vancouver. 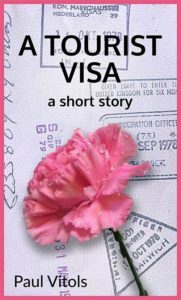 I still regard A Tourist Visa as my second serious or “keeper” short story, and thus as the second brick in the edifice of my career as a fiction writer. A Tourist Visa recalls a time and place where tension and alienation were the norm, and, indeed, its author was a tense, alienated young man. In Curtis Jansons he created a more lighthearted alter ego—one who, like himself, was just setting out on the adventure of life. We were both trying to read its signs. It’s impossible now to follow in Curtis’s footsteps, but you can, with him, absorb some of the atmosphere of that time and place—for I was there. I invite you to look in on that world, and see what you think of one young man’s (minor) struggle against the Soviet regime.